DVD Synopsis: You're about to get personal with one of music history's greatest – and loudest – bands...SPINAL TAP! Acclaimed commercial director, Marty DiBergi (Rob Reiner), takes you behind the scenes for an intimate "rockumentary" of a band whose time has come...and gone...and come again in this hilarious heavy metal experience you'll never forget! 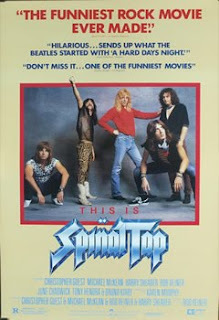 Filmmaker Marti DeBergi (Rob Reiner) is a huge fan of the British Heavy-Metal rock band, Spinal Tap. When Spinal Tap announced a 1982 tour of the U.S. to promote their new album, Smell the Glove, DeBergi jumped at the opportunity to make a documentary (or, as he called it, a “Rockumentary”) of that tour. Given an enormous amount of freedom with his cameras, DeBergi managed to capture it all: the backstage tantrums, the creative conferences, the raw emotions…and the punctuality. DeBergi was always very impressed with Spinal Tap’s punctuality. What makes This is Spinal Tap one of the funniest ‘mockumentaries’ ever made is that the film is always ‘on’. There are no lulls whatsoever in the humor; throughout the movie, we’re bombarbed on all sides by a barrage of sight gags, inane dialogue and uproarious situations. My favorite sequence has to be the Stonehenge concert, easily the single funniest moment in the film. I won’t go into too much detail except to say that the mystical powers one usually associates with Stonehenge were severely threatened by a pair of dancing dwarves. I laugh every time I see This is Spinal Tap, and I usually laugh a lot. I have a friend who was a rock critic for many years, and he said this is pretty much how it is. No exaggeration needed. And a lot of it (like the band getting lost on the way to the stage) is based on real events. Definitley one of the funniest movies ever. Anthony: It's funny you mention that, because I've been reading a lot of similar comments! Steven Tyler said the first time he saw it he didn't see any humor whatsoever, and U2's The Edge said that, during his 1st viewing, he didn't laugh, he cried! For those of us not 'in the business', it's a laugh-riot! A guitarist I know saw the movie back in the 80s and actually thought it was real. That is the mark of a brilliant satire. All the people involved with This Is Spinal Tap are absolutely hilarious. I love the scene when Bruno Kirby is talking about Sammy Davis Jr, and Nigel shuts the divider window. Just so funny/true. @Lee Ann: I've heard this quite a bit! For those in rock music, the series of hilarious events that this band endures apparently seemed routine! As for THIS IS SPINAL TAP, it's one of my favorite comedies.